Mother. Chef. Restaurant Owner. Incomparable Hostess. Friend to All. If you have been to Sedona, chances are, you didn’t need to be introduced to Chef Lisa Dahl. To say her food is exquisite is an understatement, and to find words to describe her ability to create a hopelessly romantic—yet comfortable— atmosphere would be a futile effort. The authentic Italian food she offers in all four of her restaurants is beyond spectacular, and I am just beginning to graze the surface. What really stands out is Lisa’s capacity to keep the memory of her son Justin alive. In 1994, her beloved child lost his life on the Golden Gate Bridge, after encountering a perceived robbery. The young Justin, acting as a Good Samaritan— only to find out it was a drug related transaction that had gone bad. In response to this senseless tragedy, his mother honors her beloved son every day, in every aspect of her life. Originally from Indiana, Lisa Dahl spent a large portion of her life in California. After losing her son, she packed up her bags and moved to Sedona, Arizona, a place known for releasing healing energy. While moving through the grieving process, Lisa decided she would move forward on a dream she and Justin had together — she would open a restaurant. And while her son is not alive, he is very much a part of her unparalleled success. His loving mother has tributes to him in each of her restaurants, honoring his life of goodness, and keeping it alive each and every day. In 2013, my husband and I enjoyed three days in Sedona after our wedding in Phoenix. We stumbled upon Cucina Rustica and, within minutes of being seated, the owner came over to welcome us to her establishment. After learning about our recent commitment to one another, she suggested we try her other restaurant of hers across town, Dahl and Deluca. After agreeing to give it a try, our new friend— this is how she made us feel— made reservations for us immediately. The next night, we had the most incredible culinary experience and we’ve been to Italy. Of course, our hostess was there and she arranged a romantic table for two, complete with rose petals strewn across a white tablecloth. Lisa left out no detail—making us feel like we were the only two people on earth. I often think about that weekend, not just because I married the love of my life or had the best gnocchi on earth, but because I learned that through excruciating loss, a love of life is still possible. And that it’s not just ok, but beautiful to celebrate those we love the most, even if they are not here to see it. Lisa Dahl and her team prepared the most delectable meal of my life, but more importantly, she taught me that keeping the memory of our loved ones alive is possible. And we can do it with strength and grace. I was not a culinary graduate, but I found cooking to be the most joyful thing. My mother and grandmother were incredibly influential. And I eventually found out that cooking was healing. My life came to a halt when my son died. Life as I knew it was over… yet his death brought me to where I am today. If there is a silver lining in such a tragedy, this is it. Cooking is my survival. I did not have a game plan in the beginning, but my son and I loved to cook together. I was a single mom working in the world of fashion. So I’ve always like to create beautiful spaces, including food. I dreamed of becoming a chef but never thought it would happen. You can’t always plan everything. Chemistry can make and break you. I am a sole proprietor now after years of feeling totally imprisoned by my former partner’s ego. I learned that energy, chemistry and synergy is great, but freedom is the greatest feeling of all. While the cost of freedom can be pricey, it is worth it. When it comes to business, don’t be led by your heart— lead with your head. I learned this the hard way. Take off the rose colored glasses and really look at a situation for what it is. My greatest lesson? Independence is paramount. Your tribute to your son is beautiful. Admittedly, I was taken back when I first noticed it. I found it really unusual to have a shrine dedicated to a deceased person in a restaurant… and then I learned something new. I am memorializing his life- and we should talk about those we love the most. My son died helping someone. Sadly, it just turned out he was helping a crook. My Justin thought someone was being robbed, and he was killed for it. A senseless tragedy. I could not remain in the bay area due to that tragic event. I had to remove myself completely. But till this day, I refuse to believe his is gone. He is not – he is still with me. Let’s be honest. When we lose someone through death, they never stop affecting us. His love of life lives on. It always will. We all experience loss. Why close the conversation about that? The James Beard Foundation’s mission is to celebrate, nurture, and honor America’s diverse culinary heritage through programs that educate and inspire. How did they choose you to cook for the James Beard House? They are pretty particular – they look at your reviews and make their decisions based on the accomplishments of the chef. It was the greatest honor. They reviewed my book and the event SOLD out to capacity. No. And I need one. I need help! We all need help, right? I want to do so much. For example, I want to build a non-for profit, Justin’s Garden: a food pantry. I want to create PROJECT SOUP HOPE under that foundation. The idea is create an opportunity that every time a soup is purchased, a portion of the proceeds would go to foundation to help those in need. I’d like write another cookbook to be included somehow, where the proceeds would also go to food pantry. I even have the soup I’d like to first launch. It is a legume-based soup. There is something about my soups… people love them. So I want to share that with everyone—especially kids that don’t have food on the table. Being humble. Performing random acts of kindness. Feeling gratitude and to be of service every day. Every day try to make someone more joyful – to me, that is graceful living. Learn more about the Dahl Restaurant Group and plan your visit to Sedona as soon as humanly possible. You may be thinking, “Who plans a trip around food?” Trust me — it’s the perfect pairing with Sedona hiking. 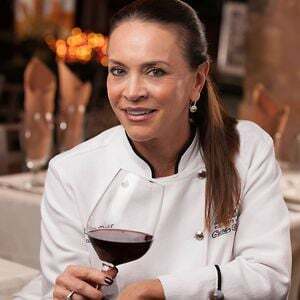 Chef/Proprietor of Mariposa Latin Inspired Grill, Cucina Rustica, Dahl & DiLuca Ristorante Italiano and Pisa Lisa. You can keep up her on Facebook and Twitter. Oh! And did I mention that Lisa is a published author? Her cook book sits on my counter top and always inspires me to create an experience — not just a meal. The Elixir of Life: Finding Love and Joy in the Passionate Pursuit of Food would make an awesome holiday gift for the chef in your life! Her Gnocchi Con Funghi E Tartufi recipe is simply spectacular – page 175.